fizzled. Gorgo, however, like Konga, remained a fixture on American newsstands throughout the early 1960s. Gorgo — huge, dinosaur-like, and buried for eons in undersea rubble — was a ringer for Godzilla. The main difference was, the islands he rampaged through were located off the coast of western Europe rather than eastern Asia. He first entered the modern world when an underwater volcano shook Ireland, releasing him from his interment. The movie built suspense with the usual indistinct sightings and mysterious deaths (one of which, naturally, was from sheer fright), until the monster was revealed so the heroes could deal with him openly. The average movie monster is dealt with by pounding him into a smoking ruin. This one, however, got the King Kong (little or no relation) treatment, with his captors more interested in making money by putting him on display, than simply destroying him. They named him after the Gorgons of Greek myth (which he didn't resemble in the least), and set sail for London. It's not that they were more likely there than anywhere else to find a venue there capable of exhibiting the 65-foot reptile, but that location offered a variety of world-famous landmarks for their special effects people to lay waste to for the amusement of moviegoers. Imagine their surprise when they found out Gorgo was a juvenile specimen of whatever he was, and they still had to deal with his mother, three times his size. Even as they were subduing Junior, Mom was busily ransacking the seas for Sonny Boy. Human firepower was insufficient to defeat her, so in the end, they just let her rescue the kid and breathed a sigh of relief when both headed out to sea. The End. The movie was released on March 29, 1961. The comic book's first issue was dated May of that year, and probably went on sale about when the movie came out. Like the Konga comic, it was scripted by the company's most prolific writer, Joe Gill (Black Fury, Space Man) and drawn by Steve Ditko (Starman, Shade). Gill remained as writer for the duration of the series, but others who drew the adventures of Gorgo and his unnamed mother included Bill Molno (Cheyenne Kid, Rookie Cop), Rocke Mastroserio (Nature Boy, The Masked Raider) and the team of Bill Montes and Ernie Bache (Sarge Steel, Jungle Tales of Tarzan). 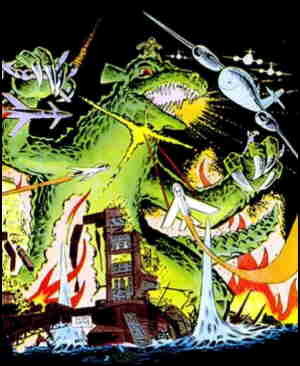 In addition to the main Gorgo title, Charlton published a comic book titled Gorgo's Revenge in 1962 and two called The Return of Gorgo in '63. Neither title was ever used for a movie. Gorgo itself ran 23 issues, the last one dated September, 1965.